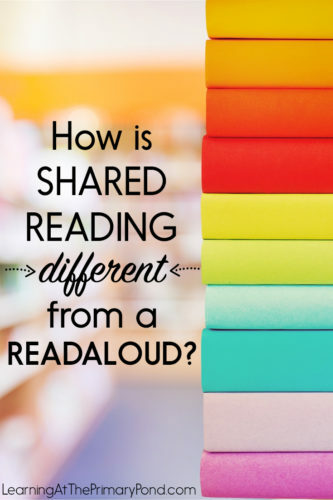 How Is Shared Reading Different from a Readaloud? And that’s definitely a valid question! In both reading activities, we share and discuss a text with students. However, these two activities look a bit different from each other, and we typically have different purposes for using them. So in today’s quick post, I’ll explain the differences between shared reading and a readaloud! In a nutshell, during a readaloud, you read a book TO students, and during shared reading, you read WITH students. We typically use more challenging texts for readalouds (great for teaching vocabulary and working on higher level thinking skills). For shared reading, we choose books that are a bit closer to students’ reading levels (because they are actively participating, reading along with you, finding words in the text, etc.). 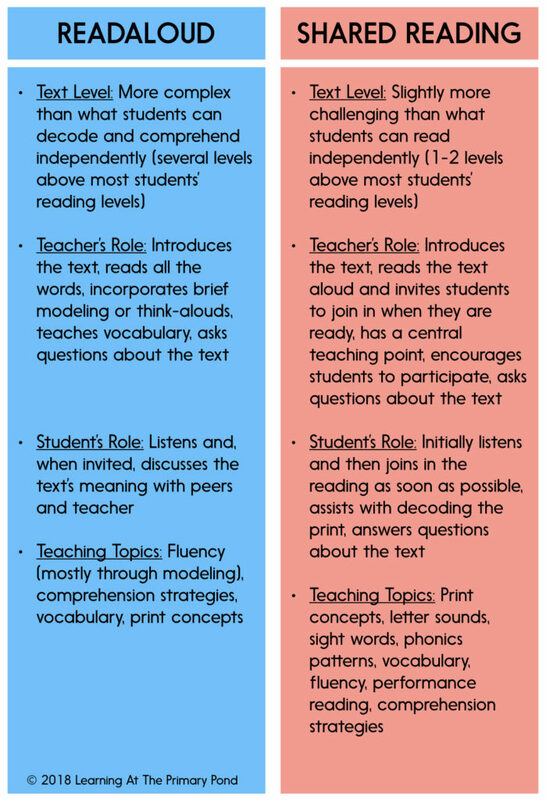 If you’re thinking about the gradual release of responsibility, a readaloud is more teacher-driven and involves more teacher modeling, and shared reading requires more active involvement of students. Want more shared reading tips and freebies? I’ve planned a few months’ worth of blog posts, videos, freebies, and eventually some free online workshops that are all about shared reading and reading workshop! Want to make sure you don’t miss a thing? Sign up below for free — I will periodically email you resources so that you don’t miss out! Burkins, J., & Yaris, K. (2016). Who’s Doing the Work? How To Say Less So Readers Can Do More. Portland, ME: Stenhouse. Fountas, I., & Pinnell, G. S. (2016). The Fountas and Pinnell Literacy Continuum: Expanded Edition. Portsmouth, NH: Heinemann. Parkes, B. (2000). Read it again! : Revisiting shared reading. Portland, ME: Stenhouse. Thanks Alison! This really helped clarify some things for me! This is a great quick description. This needs to be spread everywhere. I am currently doing my masters in language and literacy and this was a big topic. I’m so glad this was helpful!! Thanks for reading! Thanks! I took a screen shot to print and keep! Alison, I appreciate your knowledge and wonderful products. Thank you. I have a question. A coworker thinks that having students practice a book at home and then reading it to the class is shared reading. Is that correct? Also what is the difference between shared reading and guided reading? Thank you. Guided reading is done with texts that are a little bit easier than shared reading. In guided reading, students do more of the work – we “pull back” and provide less support than we do during shared reading.